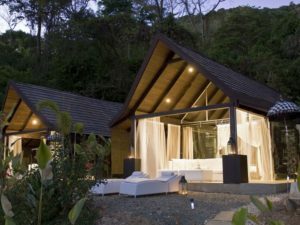 Costa Rica has a staggering number of affordable lodges and resorts to consider, and it’s a challenge picking the right places to stay — and the best ways to get there. If your flights require staying in San Jose, there are good options near the airport. The charming Finca Rosa Blanca lies in the peaceful coffee plantations, a mere ten minutes from the airport. The snazzy Intercontinental Real Hotel & Club Tower is also right close to the airport in the trendy high-end Escazu district. The hotel has an excellent gym, outdoor pool and spa. It’s worth the minimal upgrade to the new Spa Tower. There’s excellent shopping right across from the hotel. Also popular close to the airport is the Costa Rica Marriott Hotel San Jose, which has a more Central American decor. Few people stay in San Jose proper, which is more of a business center, and less of a tourist attraction. Soaking at Tabacon. Photo by Cari Gray. 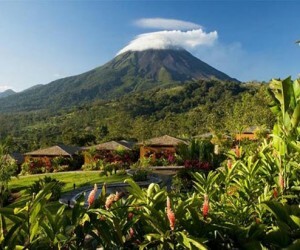 Many people want to head from San Jose directly out to the volcano rain and cloud forests. If you don’t have a car and driver, be sure to rent a car with GPS since there are no addresses in Costa Rica. The drive to the rumbling and bubbling Arenal volcano is a scenic 3-hours on twisty roads – you want to do the trip in daylight, taking in all the exotic plant farms along the way. 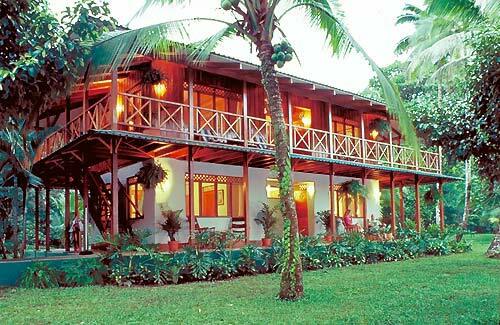 You’ll arrive in the tourist hub of La Fortuna where the best hotel in the area is the new Arenal Nayara. This property features individual casitas, with indoor and outdoor showers, private decks each with a hot tub, and gorgeous volcano views. The other top spot to stay is the sprawling Tabacon Grand Spa Thermal Resort, where their suites are worth the upgrade. Their hot springs feature over a dozen free-flowing, steamy pools spread over an exquisite garden. 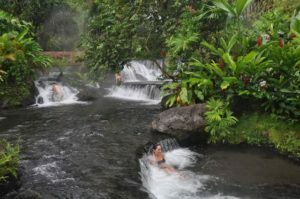 It’s possible to just visit the Tabacon hot springs, by far the best in the region. They offer a good buffet dinner package after 6pm. Be sure to head up to the Arenal Observatory, and go for a hike either on the challenging Cerro Chatto or the more relaxed Relais Silencio. Contact Hilda at Costa Rica Wonderland for rafting, horseback riding, biking and more. Don’t leave the region without taking the 480+ steps down to the La Fortuna amazing waterfall for a refreshing swim. (Bring bathing suit and towel). For a simple tasty dinner and good view of volcano, eat at the family-run El Novillo right near Tabacon. From Arenal, it’s a bumpy 4-hour road up to the Monteverde Cloud forest to spot quetzal birds and more creatures. Over on the Atlantic coast, turtles are protected in attempts to help save these appealing and endangered creatures. The area around Tortuguero features beaches with thousands of Green Turtles who migrate vast distances to reproduce. It’s an amazing sight to witness massive 200-pound turtles reproducing in the ocean. The female then lays over a hundred eggs in one session, burying them deep in the sand under cover of night. A few weeks later, the babies will hatch and make a dash for the ocean, with only 1:100 making it to maturity. The top-notch Tortuga Lodge is accessed via car/ boat through the lagoons or via a private charter flight (well recommended!). 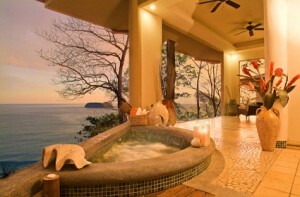 The lodge features very tasteful, well-appointed rooms, excellent showers and pool. The family-style dining is superb, as is the service. Their exclusive dinner and private turtle viewing tour is a must for any true carapace lover. For the Costa Rica beach experience, travelers head to either the Nicoya Peninsula (with the Four Seasons and Punta Isilita as the top spots), or the more southerly Osa Peninsula. 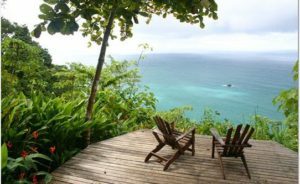 The Central Pacific Coast between the two peninsulas includes Manuel Antonio National Park, which is best accessed by a SANSA regional flight to Quepos and then a 4 wheel-drive rental car (Budget is the only office located at the airport). The best and only beachfront hotel is the elegant Arenas del Mar. The spacious modern rooms are very comfortable, and the grounds are host to countless monkeys and sloths (the three-toed kind). Local company Ave Natura offers excellent guided hiking tours in the park, as well as biking and kayaking trips. A 45-minute drive minutes on one of the country’s best roads past the palm tree plantations brings you to the hamlet of Uvita. Head up the hills to the stylish, affordable and unique Oxygen Villas. Be sure to arrive just before dark since it’s tough to find the way up. Dutch owners Edwin (importer) and Flora (architect) bought the hillside property in 2006 and two years later opened up 12 freestanding villas each with both air-conditioned and open-air space. The lodge’s infinity pool overlooking the ocean is a work of art. This couples-only experience offers very tasty 4- course dinners served al fresco by the romantic poolside. From here, you can head to the whale–shaped Uvita beach, do a surf lesson in funky Dominical or explore Marino Ballena National Park with a snorkel tour. Another dinner option is the nearby Citrus (25 min drive) , an Italian restaurant which gets rave reviews. Savvy travelers will continue south to explore the Osa Peninsula. Outside Puerto Jimenez lies the excellent jungle lodge Bosque del Cabo, located in a 750 acre nature reserve at the peninsula’s tip, straddling both the Golfo Dulce and Pacific Ocean. Learn to surf on the Golfe Dolce, hike and waterfall rappel. It’s also very close to the Corcovado National Park, an intensely rich biodiverse area, home to many “tough to spot” creatures such as tapirs, caiman and even jaguars if you’re lucky. Another top rated lodge nearby is Lapa Rios www.laparios.com. Travels through Costa Rica can be expertly planned and orchestrated by Costa Rica Expedtions. Established in 1978, the company’s founder and CEO Michael Kaye is one of Costa Rica’s travel pioneers and a leader in global eco-tourism. Cari Gray has traveled the world—initially as her parents’ excess but well-loved baggage on overseas work assignments, later as a wide-eyed explorer. For over 15 years, Cari worked for Butterfield & Robinson in the luxury active travel business, crafting and guiding custom trips annually for high net worth individuals and corporations. Her many roles at B&R included directing global marketing and public relations. She’s since started Gray & Co., applying her in-depth knowledge and personal experience to create custom high-end active journeys around the world with the best global array of hotels, resorts, villas, events, guides, tour operators and industry consortia.